I may regret this, but I'm going to let you in on one of my secret spots for finding treasures. I know not all of you will have the same opportunity that I do, but our public library has a thrift shop! I've found loads of vintage sheet music on the cheap, vintage postcards, and of course, lots of books. The other day when I was in to see what goodies were there, I picked up three maps and an atlas for $3.30. Yep, all of it. I wallpapered the space behind the shelves, starting with the three maps. I just put them up in a random fashion- I wanted there to be uneven edges and overlapping. Whatever spaces were left I went through and tore pages out of the atlas. Double sided tape was what I used to hang them up. I tried to keep everything with a surf / beach theme so all of the images lend to that. The oldest map I found was from 1962. The other two were from the late '90's and mid '80's. I wasn't necessarily trying to go for vintage- just stuff that would fit with the room. I was thrilled they had a map of the California coastline! 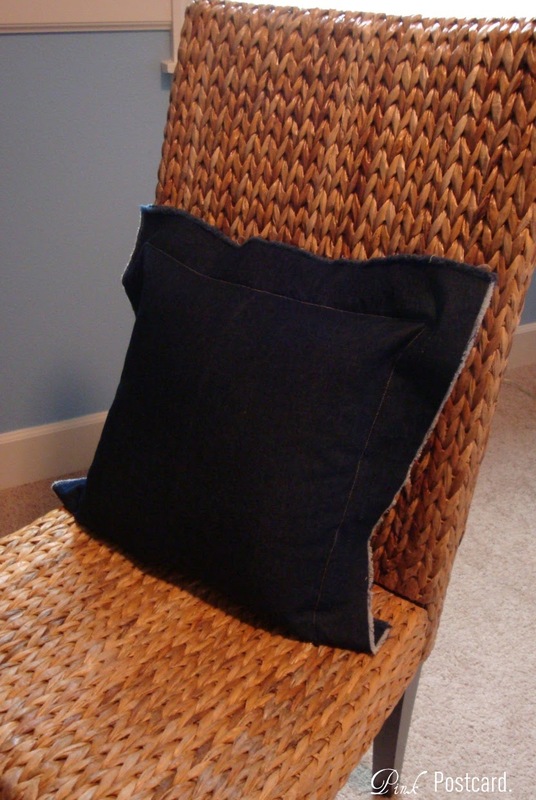 Then I made these frayed denim pillow covers for our seagrass chairs. The fabric is really soft, so it will be a nice addition! I love your shelves. So creative and thrifty. love the maps...my husband is dying to do that in our house--i just don't have a spot right now. great job. Sigh, you had me at maps. I love maps, and am doing a map theme in my family room. They add so much interest to a room! I am your newest follower, found you through Nifty Thrifty Tuesdays @ Coastal Charm. Awesome, Denise! 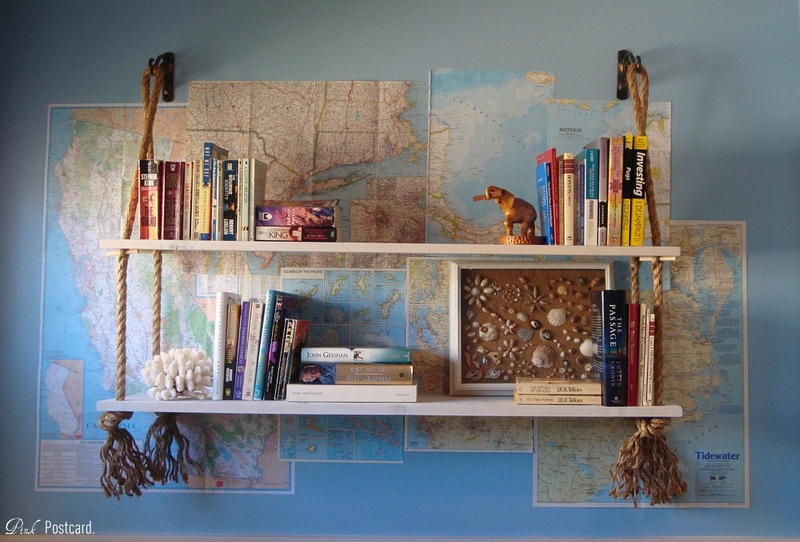 I ♥ the shelf and the maps! 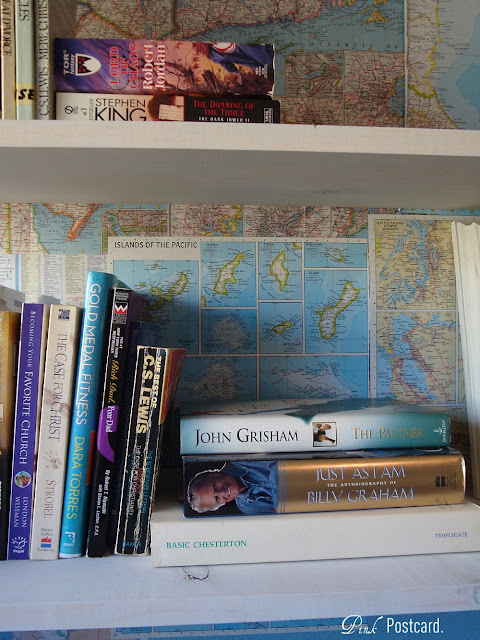 I love the maps, they really add character to the all ready wonderful shelves! I love maps too and what you did with them is so creative. They look wonderful against the blue wall. Another reason to love the library... your office is looking great! Looks very beachy! I heart it. I like this idea. 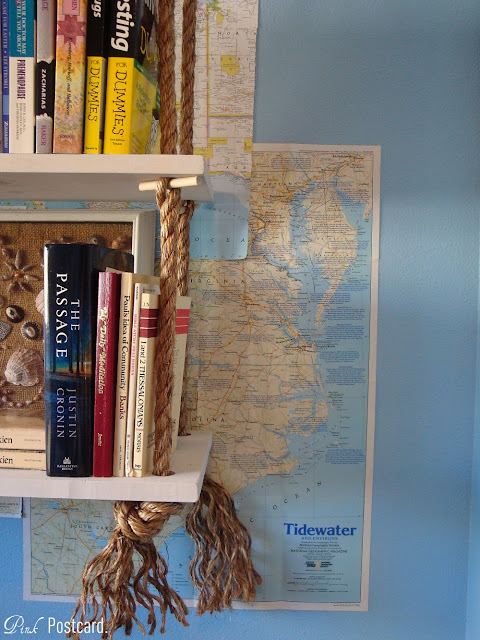 I used thrifted book pages as wallpaper in my powder room. I have a giant stash of vintage maps ready to go up. I have them from the different world wars and a few other significant dates. I just haven't figured out how to put them up without ruining them. I want to do a whole wall, but your idea looks great! I wouldn't have thought of it! I followed you over from the linky party. I can't sign in using my new account but I'm Anna at http://witbehind.com/ And it's really nice to be here. Coolest shelf and wall treatment ever! Love the rustic take on it! 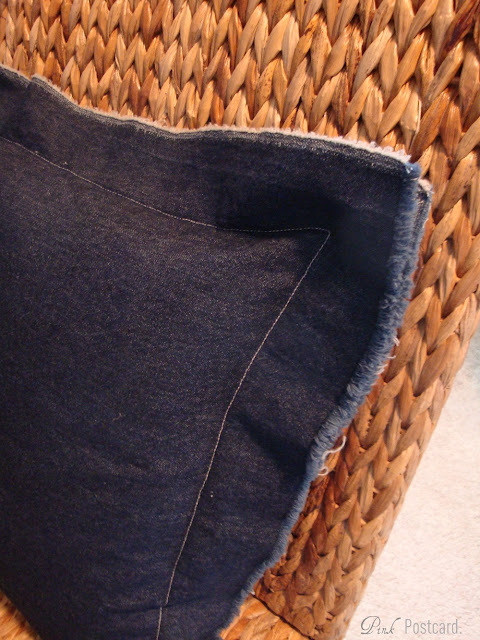 And I really loved the pillow! I could totally see that on my son's bed. Love the scrappy edges... perfect! 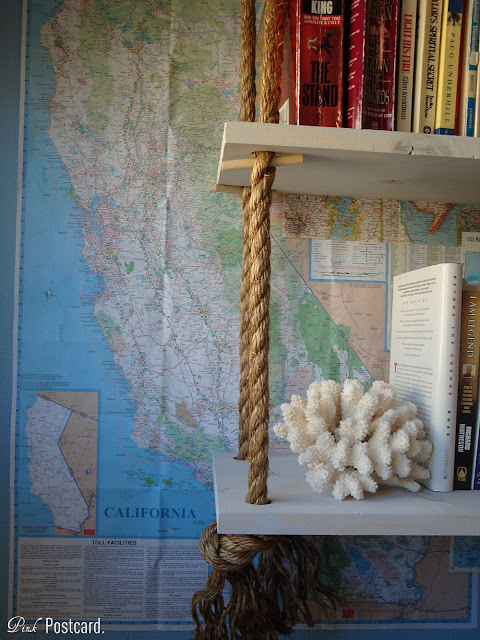 LOVE the shelf idea!! Amazing! I have those laundry detergent jars. I put liquid soap in it and ugh! not doing that again, when we're though with the liquid, I'm going to powered soap...so much cleaner to use. I like your roap shelf too. Mel's Cabin visited your blog today. This is really looking great and so comfy. What a great library source you have! I, personally , have always loved the library look. And love that shelving with rope! Denise, you never cease to amaze me. You are so beautifully creative! That looks just fantastic and I linked it to my globes and maps post too, well done!